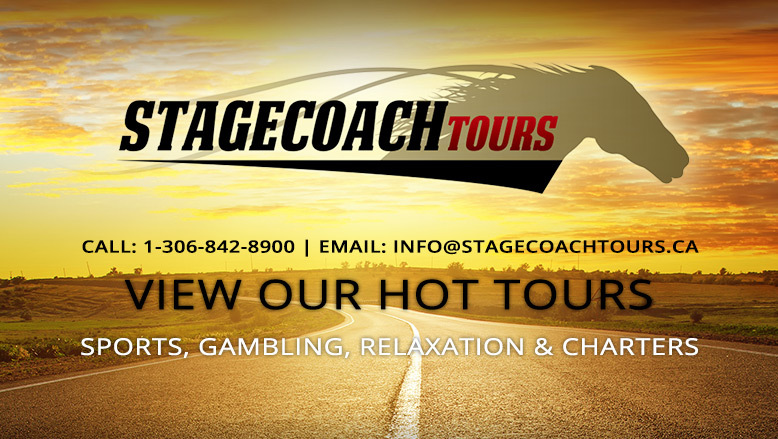 Stagecoach Tours & Charters - About Us - Proud to serve Saskatchewan! Incorporated in 1981, Stagecoach Tours is southern Saskatchewan’s largest privately owned bus company. We are extremely proud to provide a well maintained fleet of 10 luxurious and fully outfitted Prevost buses that ensure the comfort and safety of Stagecoach travellers. Our motor coaches are well maintained and continually updated. We offer regularly scheduled tours, and also respond to special destinations from customers. Whatever the needs of our clients, we will tour all over North America. At Stagecoach we have a simple goal – to give our customers the safest and most enjoyable experience possible. As a demonstration of our commitment to ensure the wellbeing and confidence of travellers, Stagecoach maintains personal liability insurance which is 40% higher than industry standards. We have and continue to be the chosen transportation provider to the Estevan Bruins, Notre Dame Hounds and Weyburn Red Wings, to name a few. Are you looking to charter a bus for a sports team, business, school group, senior’s trip or just a group of friends? At Stagecoach Tours we can create and customize travel options to suit each customer, and provide you with a competitive priced quote.